Ausstattung 1: Kleines Fischerdorf mit einer Fülle an mediterranen Speisen - App 2. Ausstattung 5: Neu, 2 x Terrasse mit Meerblick, Grill, OSTERNFERIEN-FREI! Super Preis! we spent 3 beautifil weeks in the appartment. All was even better like in the description we read in advance. It was perfectly clean, the kitchen was well equipped, the balcony / terrrasse was huge enough to welcome 10 people without any problems. We were allowed to use the garden and to take fruits and vegetables and were handle from the owners like family members. The 2 outdoor showers were nice to use in summer time. Once there wa any help needed, the owners helped us best possible. 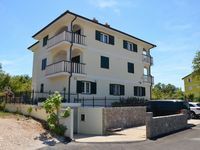 The appartment is located 10 walking minutes from the center and the harbour. Nice restaurants with good price level were in same distance. 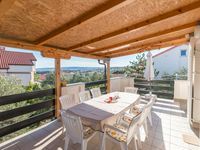 We can really recommend this appartment to spend beautiful holidays in Croatia!! !